Everything You Need To Know About the Labrador Retriever on 1 Page. The Labrador Retriever comes equipped with a built-in desire to please you, and a personality that bubbles like champagne. abradors are large, fun loving dogs, but before you rush out to buy one of these adorably plump puppies, you may want to consider whether he is the right choice of dog for you, and your family. Labradors are classified as a member of the American Kennel Club's Sporting Group. There are two distinct varieties of Labradors. The American bred lines feature dogs somewhat taller than the English bred lines, which have more body, and a more robust look to them than the American bred stock. 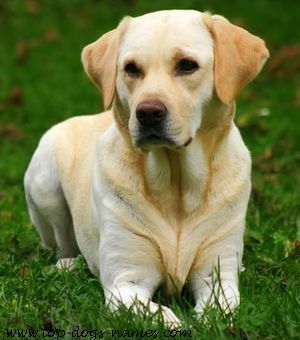 The Labrador Retriever is dependable and powerfully built, they weigh from 55 to 75 pounds and stand 21 to 24 inches tall at the shoulder. These beautiful dogs originated in Newfoundland, Canada. Where they were bred to spend hour upon hour in icy waters retrieving, and hauling fishing nets in to the shoreline. So, if fishing or boating is your thing, then this dog makes the ideal companion. Labs can play for hours on end, stamina is a byword in this breed. Their soft, chocolate brown eyes sparkle with intelligence, and reveal their gentle nature. Their coats can be yellow, chocolate, or the most common--black. The dense hair of the Labrador's coat is water resistant, and needs very little care. Just brush your Lab once or twice a week to remove any loose hair and dirt. Labradors need plenty of exercise, especially as youngsters when they are a bundle of energy. They are not the ideal apartment dog. He will need plenty of room to run and play. A fenced yard is good, but even if he has ample space to play, he will need a brisk, daily walk, on and off of the lead. They love to swim, and its a great experience to swim with them. Labrador Retrievers like their food, and can eat quite a bit of it. So, be careful as they can quickly become overweight, feed just enough, and no more. Labs can suffer from eye problems such as PRA, and are prone to hip dysplasia. Otherwise the Lab is a relatively healthy breed. Since Labradors are large and powerful dogs, it is important to start training your puppy right from the start. Normally training a Lab is quite an easy task. Although jumping up is a problem with this breed, and you could find yourself literally being bowled over by an adult dog. Labradors can be a bit head strong, and stubborn at times, so, going to puppy obedience classes to socialize him is a good idea. Check it out. You'll meet lots of new puppies and their new owners! Most Labrador Retrievers puppies grow in to excellent family dogs, with a reliable, friendly temperament. Consequently, they are an extremely popular breed. But, the demand for puppys can cause problems of their own. A healthy, even tempered Labrador is a real pleasure to own. So, if you've made up you mind that a Labrador Retriever is the right dog for you, be sure that you find a reputable breeder to buy your puppy from. Check out these Labrador Retriever Names.